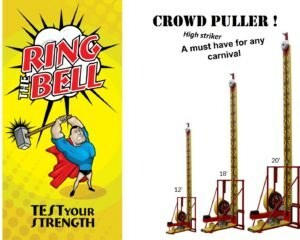 It a crowd puller and a must have for any carnival ! Who can resist this timeless classic. Show off your strength with this Hi-Striker, and listen to the crowd cheer. hi striker is the perfect addition to any carnival or other special event you may be planning. class="pirenko_portfolios-template-default single single-pirenko_portfolios postid-4279 samba_theme samba_left_nav samba_left_align samba_responsive wpb-js-composer js-comp-ver-5.7 vc_responsive"